A handful of enterprising bartenders around the world are ushering in a renaissance for mixed drinks. In his book Martini, Straight Up: The Classic American Cocktail, author Lowell Edmunds, a professor and doyen of martini lore, mentions a certain Fred Pool who devised a technique of soaking stones in vermouth(a fortified wine, flavoured with aromatic herbs, roots, and barks, used in classic cocktails) in the late 60s, when ultra-dry martinis were de rigueur. Pool reasoned that the minerals in the stones made the martini desirably drier. As outrageous as it sounds, his theory has been put to test by Italian mixologist Christina Bini, of the TriBeCa restaurant in the heart of downtown Manhattan, who serves her version of martini on the rocks. Actual rocks. The stones are of two varieties; certain porous white ones from the Liguria region of northwest Italy that have a high salt and minerals content, and some relatively smoother, less porous, black stones from Mongolia. These are soaked in vermouth for at least 12 hours (the more porous the rocks, the higher the vermouth content in your drink) before they hit rock bottom in a martini, making it deliciously dry and equally eccentric. 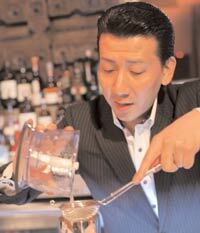 Bartenders like Bini are members of an elite (almost secret) society of alchemists of alcohol. They source exotic ingredients and use advanced equipments like pacojets (to freeze liquids into sorbet) and immersion circulators (that keep wet ingredients at a consistent temperature). Their concoctions of oddball flavours and textures have made their way into the menus of swish bars and restaurants across the globe. The last five years have seen a surge in popularity as consumer tastes shift past the safe, classic cocktail. This departure from the bartending of yore is called molecular mixology or progressive cocktail making. While chemistry of another sort is the front and centre for most folks swirling a cocktail by the bar, molecular mixologists behind the scenes are conducting experiments that belong in a laboratory. They push the boundaries of science to amalgamate, emulsify and restructure alcohol with chemicals such as nitrogen, alginates, and chlorides. The strange hypotheses yields sublime results: an intoxicating ice cream using liquid nitrogen; a mojito mist that is sprayed instead of sipped; whisky marshmallows; an ice-cube-like gin and tonic jelly; and a rum-based Hurricane cocktail that erupts like a school science project. The dishy, bottle-flipping bartender played by Tom Cruise in the film Cocktail is now passÃ©; replaced by a madcap scientist. This new-age chemical-cocktail movement took off at bartending symposium in Paris, organised by Dutch distiller Bols in 2005. Soon enough, RÃ©my Martin's Cointreau introduced a kit to convert its orange liqueur into caviar pearls. Moet & Chandon followed with a line of champagne drinks with foam and bubbly caviar. Joining the revolution was Diageo, the makers of fine spirits such as Ketel One vodka, CÃ®roc vodka, Tanqueray No.TEN gin, DonJulio tequila, Zacapa rum, and Johnnie Walker Gold Label whisky. The brand launched its Diageo Reserve World Class competition in 2009. The week-long competition tests a bartender's ingenuity, creativity, skill and knowledge of spirits in the quest of ingestible alcoholic perfection. BT More brings you two signature recipes by renowned mixologists Spike Marchant and Simon Difford. Method Pour vodka and liqueur into chilled glass, top up with champagne and stir lightly. Method Cut passion fruit in half and scoop out flesh into shaker. Add vodka, passion fruit syrup, pear and lemon juice. Shake with ice and strain into ice-filled glass. Top up with champagne. Garnish with a cape gooseberry on the rim. There's more to a bar than just the alcohol and an ice-box. Here's our list of the essential bar equipment that makes the cut. Boston Shaker The mixing glass fits into the shaker and forms a tight seal for drinks that meed a good shake. Hawthorne Strainer A wire strainer that fits into the stainless steel part of the Boston Shaker. Julep Strainer Looks like a large spoon with holes in it. Dobble Jigger For a perfect pour. Muddler For crushing and muddling. Citrus Stripper For the perfect, prolooking garnishes. Twisted bar spoon A long spoon for gentle stirring of tall drinks. This year's final round was held in New Delhi in July; a recognition of the city as a vibrant metropolis with a new and exciting cocktail culture, anchored by India's position as one of the fastest emerging luxury goods markets in the world. Representing India in the event was Hemant Kumar Pathak of Taj Palace Hotel, New Delhi, who won among the national competitors. The coveted Diageo Reserve World Class Bartender of the Year 2011 title was duly earned by Manabu Ohtake from Tower's Bar Bellovisto, Tokyo, Japan. He endured multiple rounds of master classes, and cocktail challenges to receive the highest accolade. While the Indian luxury spirits market is at present relatively small, at an estimated »16 million, its future is bright. The sector is expected to grow at a projectedannual growth rate of 36 per cent by 2015. Molecular mixology is still nascent, bordering on gimmickry, for a still adolescent market. "The difference is that of haute couture and fashion," says British mixologist and global ambassador of Diageo Reserve World Class, Spike Marchant. "While not every technique in haute couture gets included in fashion at large, some aesthetics and elements do trickle down to mainstream fashion eventually. Molecular mixology, similarly, is the progressive approach to bartending." For instance, flame and gelatin are two important components of a bartending trend that are migrating from upscale nightclubs to local watering holes. The flambÃ© technique, a novelty not long ago, is now commonplace in Indian pubs. On this paradigm shift in the global drinking culture, American master mixologist Dale 'King of Cocktails' DeGroff, who was one of the judges at the event, says, "A major factor behind bartending coming of age could be the more common usage of artisan products like tequila, cachaÃ§a, pisco, mescal, and sake. Once just footnotes in drink books, they have now found their way into connoisseurs' cocktails." The technique for concocting these cocktails is a complex process of reinventing, deconstructing and reconstructing familiar drinks, and then layering and intensifying the flavours with infusions. However, there's very little formal education to be imparted in this frontier of science. As mixologist Erik Lorincz, the winner of the World Class Bartender of the Year 2010 says, "It is more of a trial and error approach at the moment. We use principles of molecular gastronomy and apply them in a bar environment." DeGroff believes there is a need for awareness among both young beverage professionals and consumers about modern mixology, tastes, palate and pairing. "Global beverage companies have located this need and have answered the call, as witnessed by Diageo's World Class Program, which is a year-long global training programme in liquid aesthetics," he says. Conceptualising and creating these innovative coktails is no cakewalk. According to most people in the industry, one needs in-depth knowledge of the craft and the molecular structure of a liquid, to experiment with its texture, density or viscosity. And we can vouch that chemistry in a cocktail glass is far more fun than experimenting in a beaker in a laboratory.